For those of you who didn’t know, WinUSB is simple tool allows to create bootable Windows USB install stick from Ubuntu Linux. It comprises of both GUI and command line tool and you can decide to choose which to use based on your preference. This tool supports Windows 7, 8, Vista, XP and can use either an ISO or a DVD as a source. Currently there is no version for Ubuntu 14.04 in Ubuntu Repository. To successfully install Winusb on Ubuntu 14.04, you need to install the Saucy version and run the dependencies fix switch to fix the dependencies. This article assumes you have at least basic knowledge of linux, know how to use the shell, and most importantly, you host your site on your own VPS. The installation is quite simple. I will show you through the step by step installation Winusb on Ubuntu 14.04. Step 3. Fix dependencies errors. Step 4. Afterwards, you can search for WinUSB in Unity Dash and use it to create a live USB of Windows in Ubuntu 14.04. These three steps will install the WinUSB graphical interface and the WinUSB command line tool. The WinUSB GUI is much easier to use than the WinUSB command line tool. Congratulation’s! You have successfully installed Winusb. Thanks for using this tutorial for installing Winusb on Ubuntu 14.04 system. 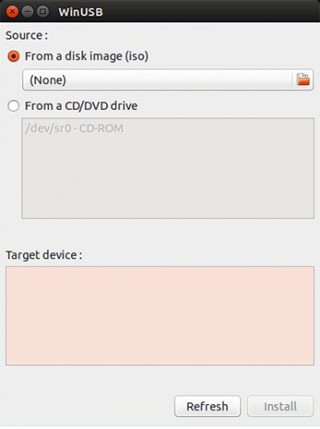 Related Posts of "How To Install Winusb on Ubuntu 14.04"